The Tacoma Rainiers went 1-for-16 with runners in scoring position and left 14 men on base Wednesday in a 5-2 loss to the 51s at Cheney Stadium in Tacoma, Wash. The Tacoma Rainiers had several chances to make the 51s pay on Wednesday. With 51s pitchers walking 11, the Rainiers had runners in scoring position seemingly all day. But when they needed it most, Las Vegas pitchers always seemed to come through. Kyle Regnault bailed Kevin McGowan out of a jam. Ian Krol bailed Regnault out of a jam. And Krol got himself out of a jam. And because of that, the 51s walked away Wednesday with their second straight win, beating the Rainiers 5-2 at Cheney Stadium in Tacoma, Wash. The Rainiers (41-38) went 1-for-16 with runners in scoring position and left 14 men on base. Tacoma scored in the second inning off Chris Flexen, making his first start since June 16, and the ninth against Paul Sewald. 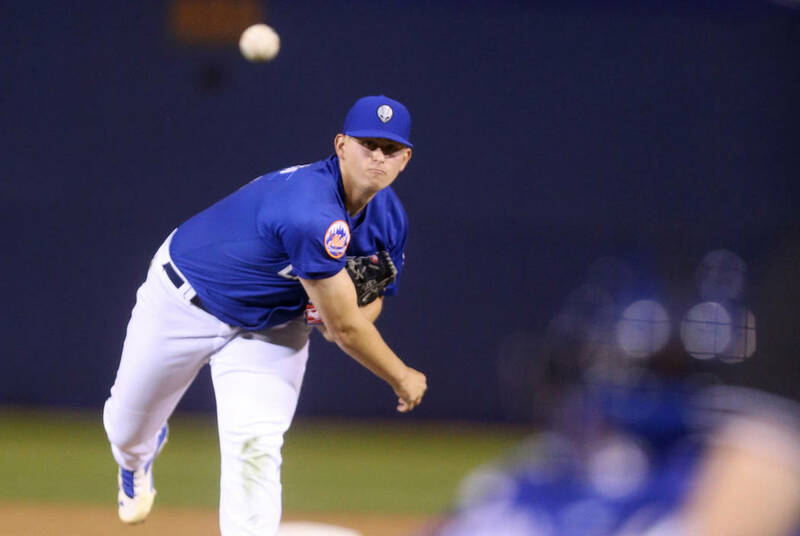 Flexen had been called up and sent down twice since his last start and appeared to be rusty, having worked only 1 1/3 innings with the New York Mets since his last start in Triple A. He walked five in three innings. Flexen was supported by a run in the first inning on Luis Guillorme’s bases-loaded walk. After Tacoma scored in the second, the 51s responded with Patrick Kivlehan’s RBI single in the third. Las Vegas (35-44) scored in the sixth inning on Jose Lobaton’s third home run this season and in the eighth on Christian Colon’s sacrifice fly and Jeff McNeil’s RBI double. McNeil had three hits and Lobaton and Ezequiel Carrera two apiece for the 51s, who won for the seventh time in nine games. Corey Oswalt was held back from his scheduled start Wednesday, but DeFrancesco said Oswalt was not hurt. The right-hander could be an option for the Mets this weekend in place of starter Jason Vargas, who is on the disabled list with a strained calf. More 51s: Follow all of our Las Vegas 51s coverage online at reviewjournal.com/51s and @RJ_Sports on Twitter.